I love greens, but I didn't always. In my ovo-lacto days, I referred to myself as a "vegetarian who doesn't like vegetables." Childhood memories of iceberg lettuce covered with French dressing, and the overpowering smell of long-cooked kale, did not inspire me to enjoy green vegetables unless they were well-disguised with cheese or other fatty foods. Fortunately, I learned that if fresh kale or chard is stripped of the tough stems and steamed or sautéed for just a few minutes, it becomes delicious! I now make these vegetables a regular part of my diet, along with Romaine lettuce, spinach (my favorite green vegetable), bok choy, and other foods I once avoided. One delicious, simple dish I enjoy is Dr. Andrew Weil's Potatoes with Kale. 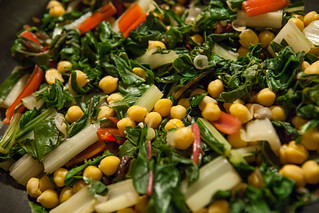 I sauté in veggie broth as I don't cook with oil, and often substitute chard for the kale. Another tasty Dr. Weil recipe is Tofu and Beet Greens. Again here I sauté with broth instead of oil, and usually use chard. 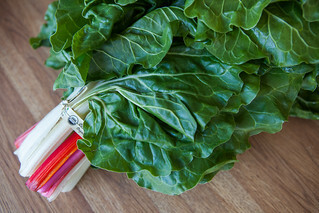 While I normally cook my greens, I have found a couple of raw greens preparations that I like. 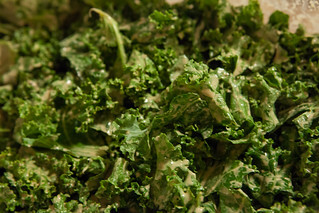 The above, Garlicky Kale Salad, I found on the McDougall forums. Massaging the dressing into the kale and letting it marinate makes the raw greens much more tasty. When I'm too lazy to make a real recipe, sometimes I'll just nuke a box of frozen spinach with some veggie broth and a little garlic powder, dump it over a baked potato, and top with homemade Parmazano (nutritional yeast / almond blend). I always have frozen spinach on hand as I find it much easier to deal with than preparing and cooking fresh spinach. Much healthier and more satisfying than the "Berkeley's Best" food truck baked potato I modeled this after; that one was dripping with melted cheese. Very glad I finally got over my cheese cravings; never would have imagined there would come a time when I would actually crave green vegetables! I love chard and mustard greens and bok choy and sometimes spinach (it has to be THOROUGHLY cooked - undercooked spinach makes my teeth hurt) but kale is Just Not Xta Food. I can tolerate it if I hide it in a vegetable soup with 8-10 other vegetables proportionately and chop it very very finely and, yes, remove all the stems. My "I hate vegetables" childhood was all about my mom not applying flavoring. She made ONLY lightly steamed plain vegetables. Her mom used to overcook vegetables so she compensated by, in my opinion, undercooking them. Yeah, I'm not a fan of the completely naked vegetable. Fruit, sure, but most veggies could use a little boost.